These charming Coastal Painted Fence Fish are handmade out of salvaged picket fence posts. Each is hand-painted and a true work of art! They are approximately 3 inches wide by 23 inches long. 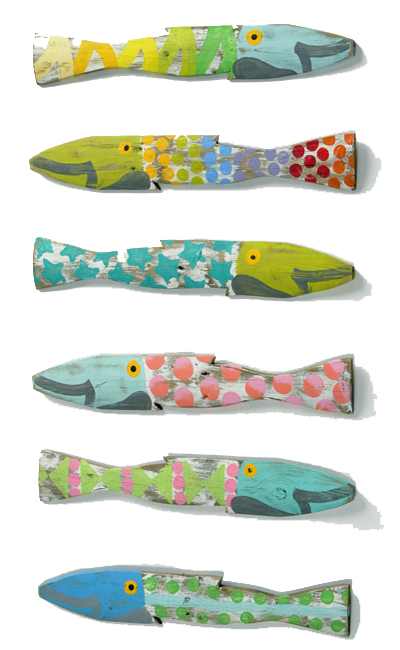 Because of the handmade nature of these fish, the colors will vary slightly. Perfect for your beach house, lake house or bathroom! They can be placed outside or hung inside... each has a hook on the back. Custom made upon order placement so may not be returned. Each fish is signed by the artist "SKS". Set of 6. Not eligible for return or exchange. Please view our return policy for more information. Ships USPS ground.